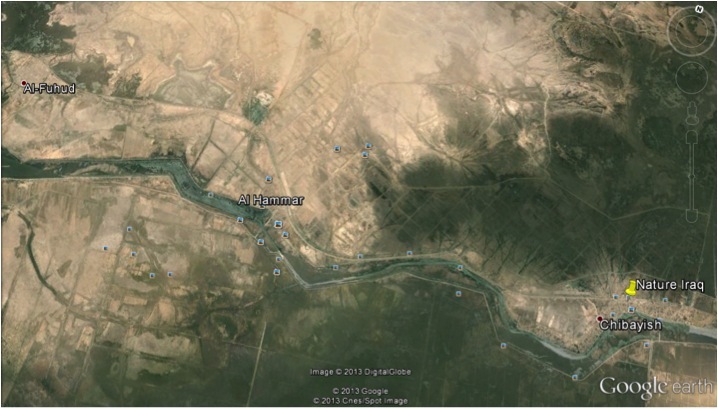 The two towns are characterized as large urban areas located between the marshes and the Euphrates river. Usually these kind of villages have two or more sewage network lines that collect wastewater from the houses. These lines connect to a local pumping station. 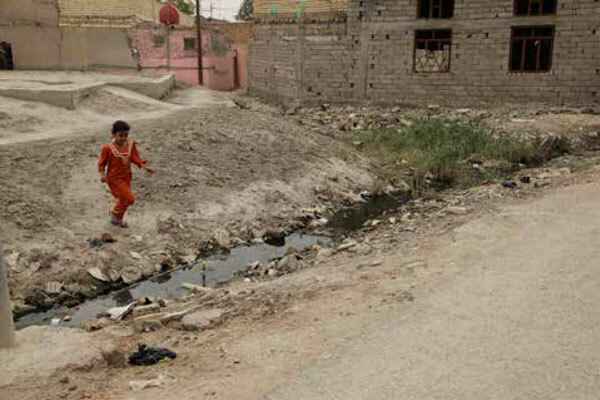 From there the sewage goes into the marsh area or into the Euphrates causing pollution and extreme un-hygenic conditions. Each town has two pumping stations that can be connected to a wastewater garden system. 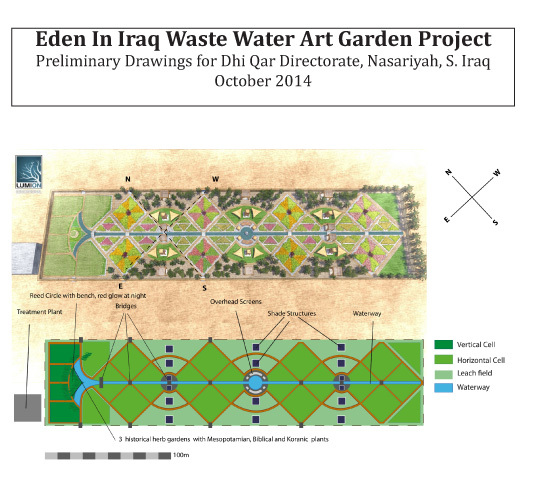 Our first environmental wastewater art garden is at Al Manar. 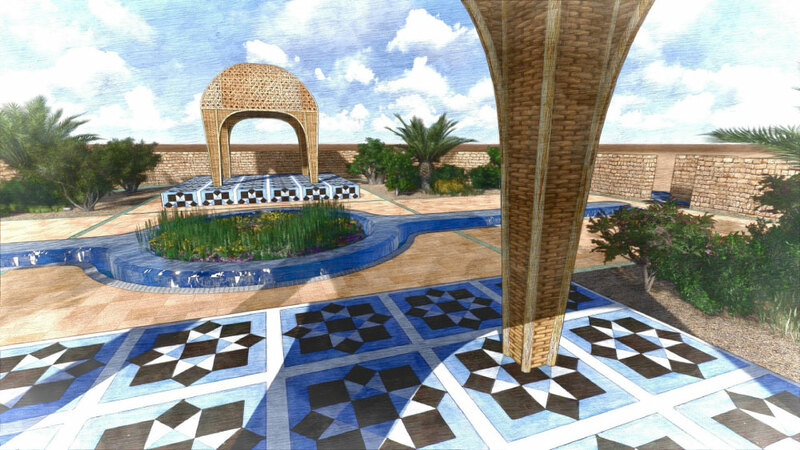 Our design will incorporate elements to bring visual beauty to this devastated area. 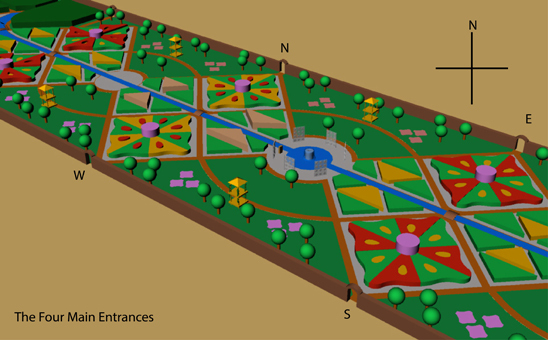 Meandering pathways through and around the garden will allow time for reflection and recreation. 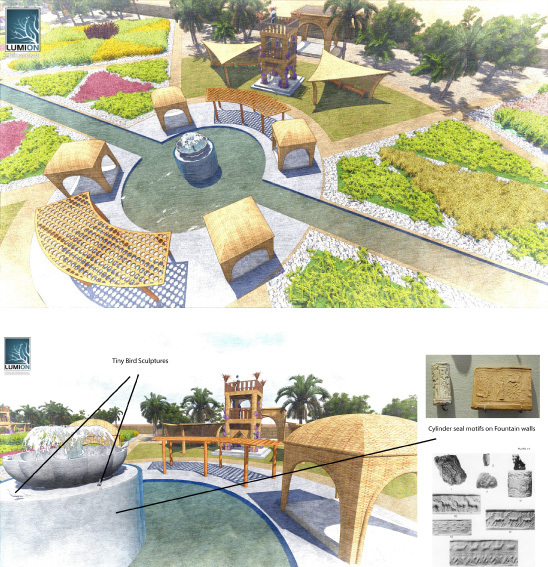 Locally designed dried woven reed structures will provide shaded viewing stops overlooking flower beds designed using traditional weaving patterns. 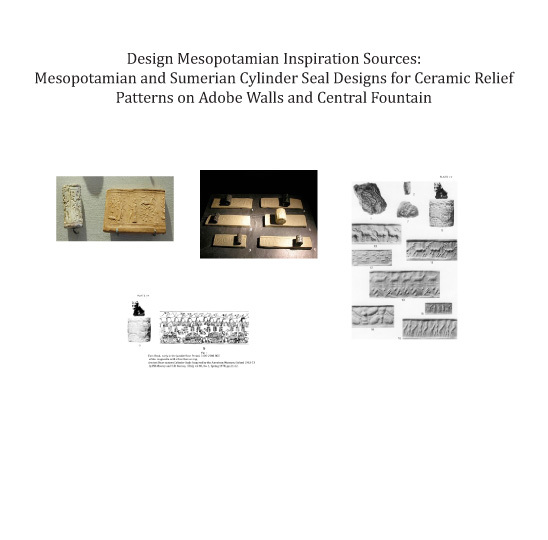 Ceramic tiles using Mesopotamian cylinder seal graphics will link the walk around the circumference to the rich history of Mesopotamia, the Garden of Eden up to the present, and of re-genesis and restoration. 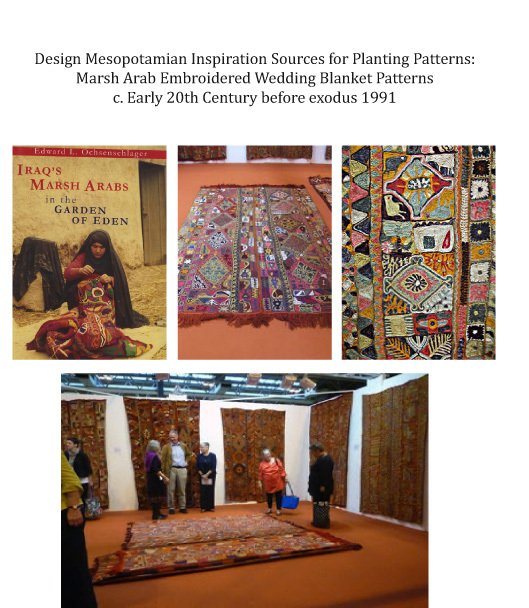 Historic and local stories as kufic text may be created; messages from the marsh Arab population abroad may be incorporated. 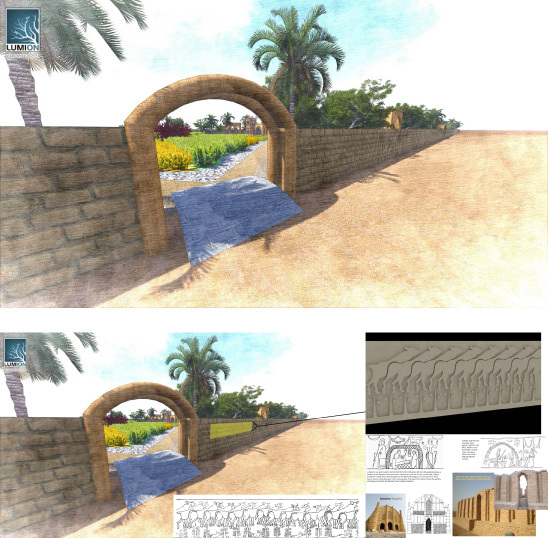 SUNY, Stonybrook, PhD candidate in archaeology, Abdulamir Hamdani from Al Fuhud, will advise on ideas and images to incorporate into the design. He is an expert on ancient sites in the marshes and how they relate to present life. In Summer of 2014, the Iraq government officially created Iraq’s first Mesopotamian Marshlands National Park. 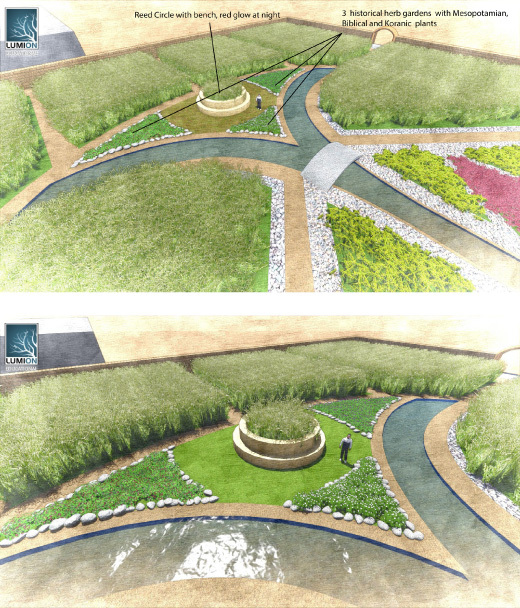 This will eventually attract tourists to this area which is a crucial habitat for migratory birds and water fowl. 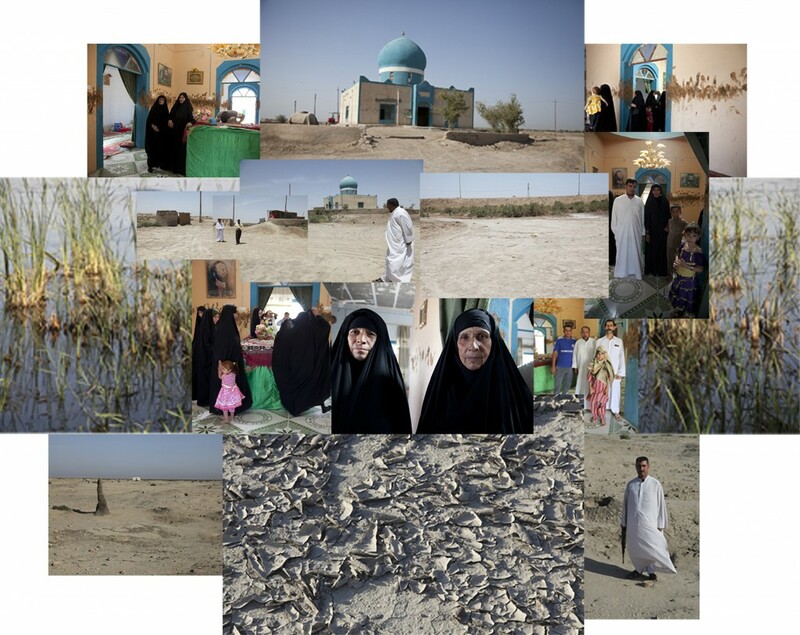 The Marsh Arabs’ return to the marshes over the past ten years and Nature Iraq’s ongoing marsh restoration efforts are momentous. 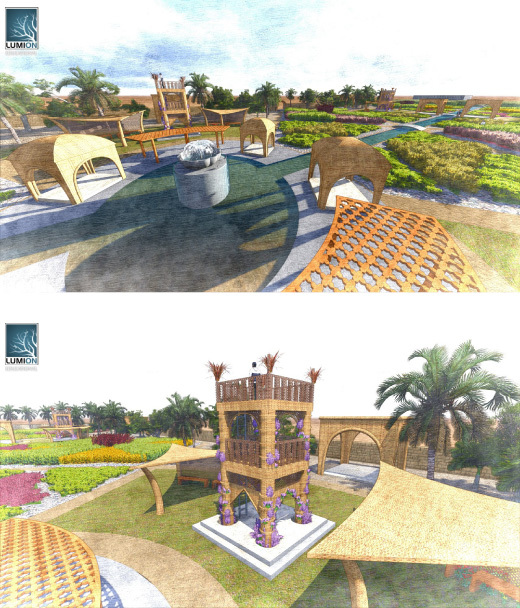 This first wastewater garden at Al Manar will celebrate these events. Where but in nature can the wounds of conflict be restored? View of entire 20,000 sq. 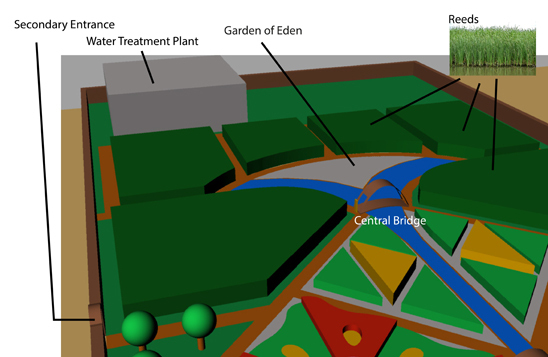 meter garden (5 acres, half of which are wastewater garden beds and half are secondary (leach field) gardens that will support large trees. 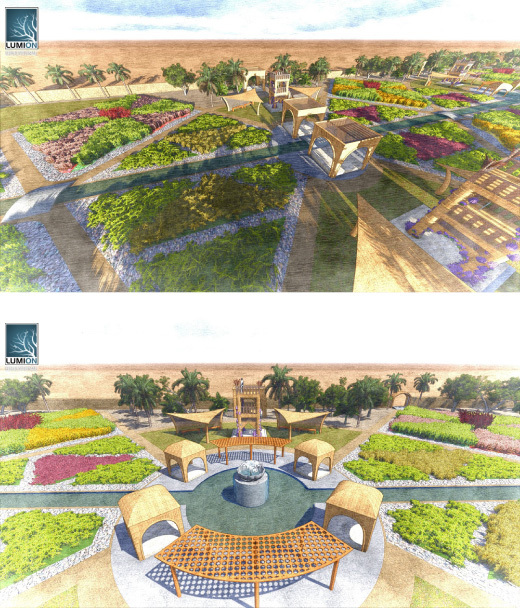 Below are earlier proposed wastewater garden sketches (2013) for the no longer viable site at the Mohammed Shrine. 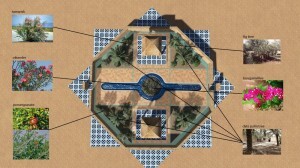 We hope to incorporate some of these design elements into the new site at Al Fouhood. PAST SITES, FOR THOSE INTERESTED IN OUR PROCESS. 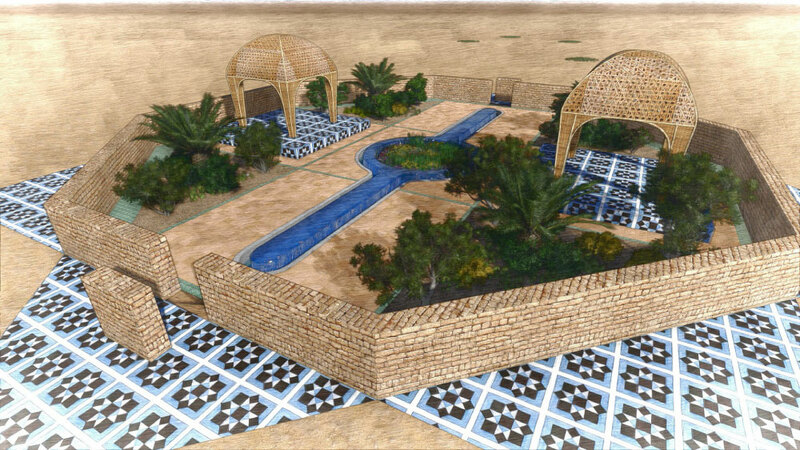 The first site studied for a wastewater garden art garden was at the Mohammed Shrine, west of Al-Chibaish, a privately owned family shrine honoring a descendent, Mohammed, who fought in the war circa 700 A.D. that caused the split in Islam between Shi’ites and Sunnis. This site is close to the road west to Nasariyah and the famous Mesopotamian city, Ur with its ziggurat, temples to the moon god, and the house thought to be that of the family of Abraham. These sites are less than 2 hours away. This site is visited weekly by pilgrims enroute to significant Islamic sites who stop to pray and rest. The extended host family maintains the facility. New septic tanks and bathrooms would have been needed and plumbing to connect to a Wastewater Garden and subsoil irrigation/leachdrain area for treatment and reuse of the blackwater from the toilets. The first proposed design re-built and re-located the existing restrooms into the hillside below the shrine. 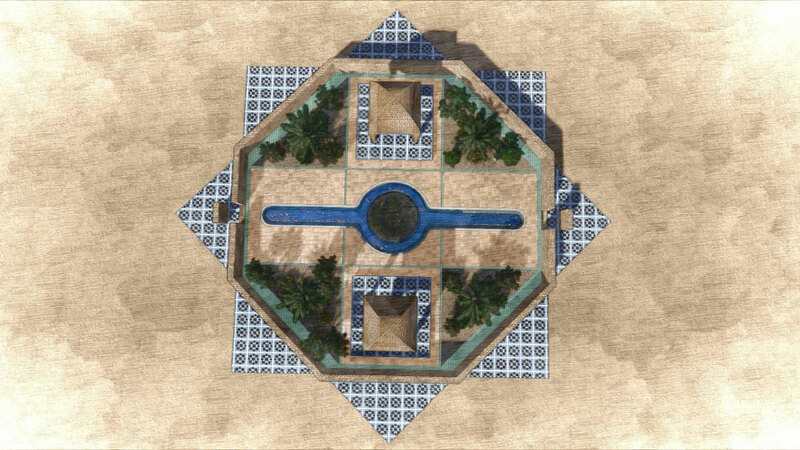 The wastewater generated from the restrooms fed a central circle of native reeds (Phragmites australis and Typha domingensis) a framing border of date palms (Pheonix dactilifera), and four arcs of native and historic plants from Iraq. A walkway proceeded down the hill lined by date palms, across an adobe paved porch, and into the circular garden. The central reed circle was divided by a line of recycled glass, melted and poured into a linear channel, its aqua blue evoking water. 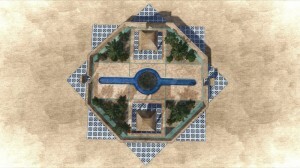 The channel was surrounded by a plinth of adobe pavers. 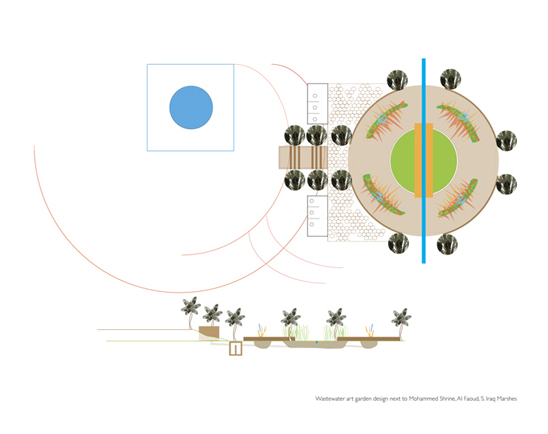 The garden wall functioned as a seating wall and contains plant resin stabilized sand paving. The wastewater system was subsurface and waters the garden. Water was to be introduced into the restrooms in a traditional pitcher manner. 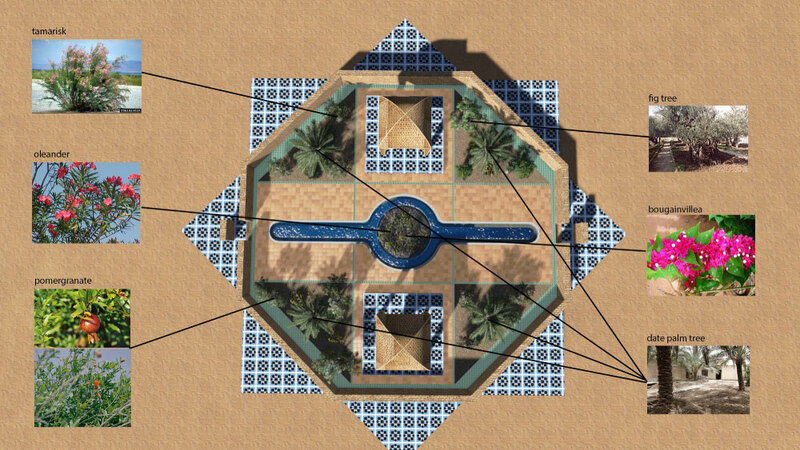 The Al Shama family had meembers not comforatable with wastewater so close to the shrine, so this project was tabled. 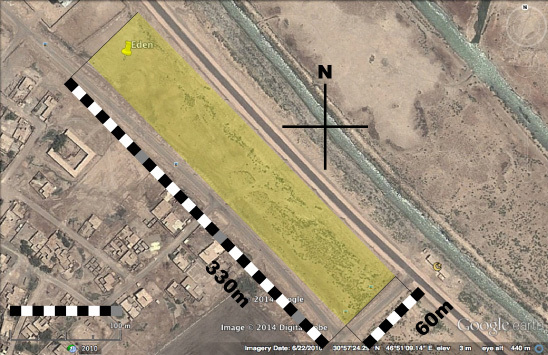 The second potential site was at Al Sajeah Switch Station, larger in scope. 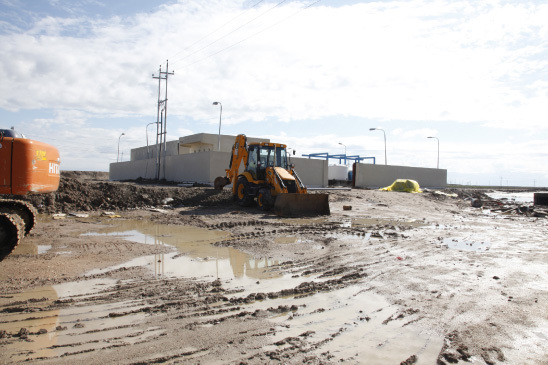 There is a pump (switch) station that receives sewage and rainwater from a large section of the city of Al-Chibaish. Currently, the switch station simply pumps the sewage, completely untreated, through pipes into the Euphrates River nearby. 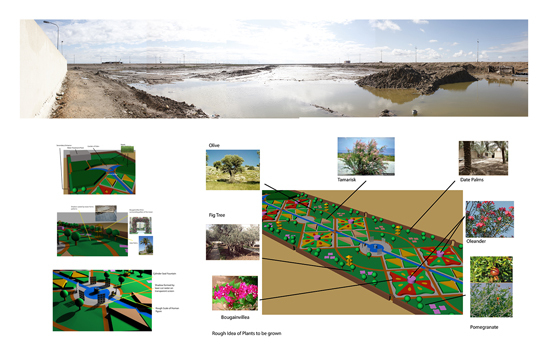 After discussions with the city council of Al Chibaish and environmental engineers from the Provincial Iraq Environmental Office in Nasariya who are in charge of the switch station, there was great interest in installing Wastewater Gardens in a Civic Park layout to treat the sewage and using the treated wastewater to subsoil irrigate useful and beautiful plants. 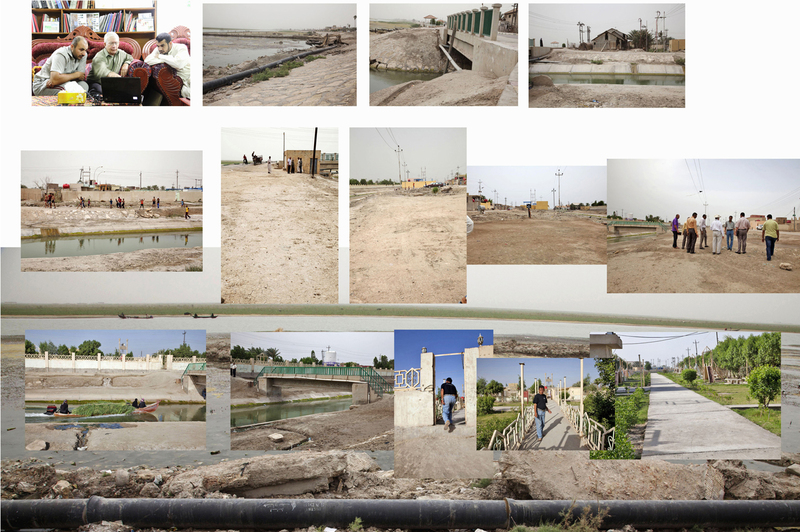 The switch station is located on the side of one of the canals which connects the Euphrates to the Central Marsh. Large areas (equivalent to two soccer or football fields) were available on either side of the switch station for the new systems. This was a much larger civic project. It was hoped Iraqi artists could be enlisted to contribute to the design. 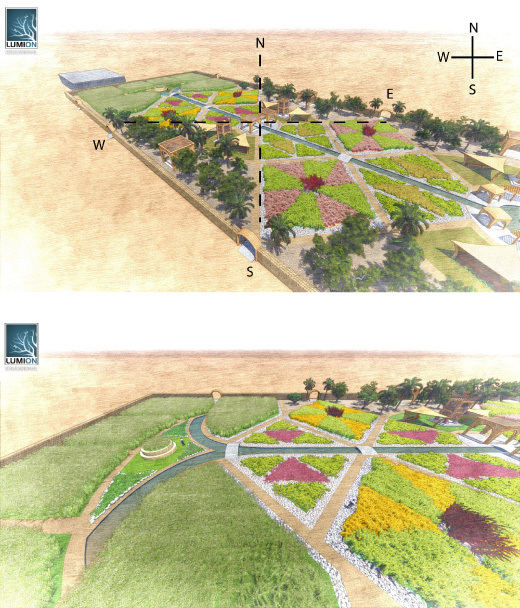 The site offered the possibility of not only a drastically needed waste system for Al-Chibaish but the potential for a major Public garden/artwork memorializing both the loss and rejuvenation of this 7000 year old Marsh Arab culture. A year later the Town Council decided to develop the site commercially. 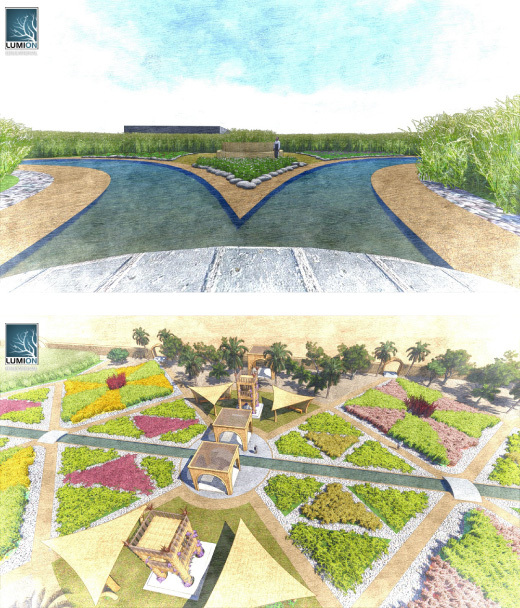 Al Sajeah rainwater/sewage treatment plant. The Nature Iraq Visitors and Conference center, Al-Chibaish. 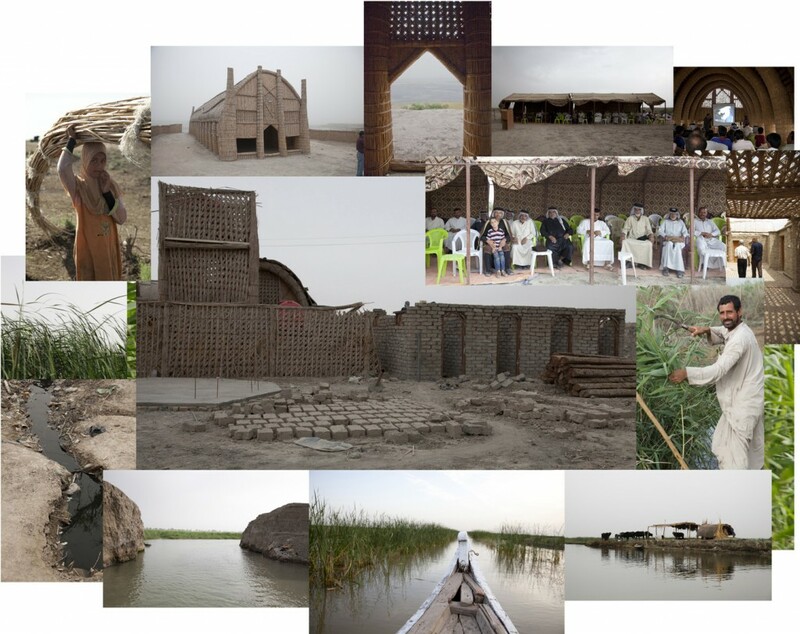 The Nature Iraq Visitors and Conference center, Al-Chibaish was funded by the Italian Ministry of the Environment featuring innovative architecture designed by Italian architects using traditional reeds and adobe (sun-dried clay bricks). 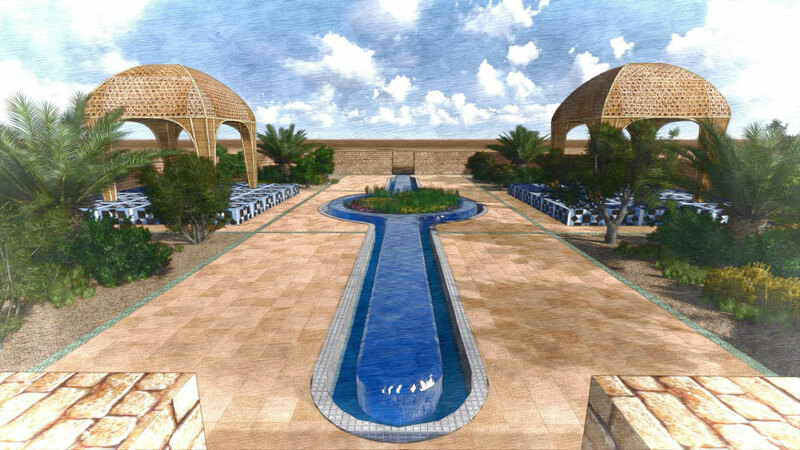 This beautiful complex of buildings, including areas for workshops and conferences with a traditional Mudhief reed structure meeting hall, will house visitors to one of the entry points for the Mesopotamian National Park (officially announced in July 2013). 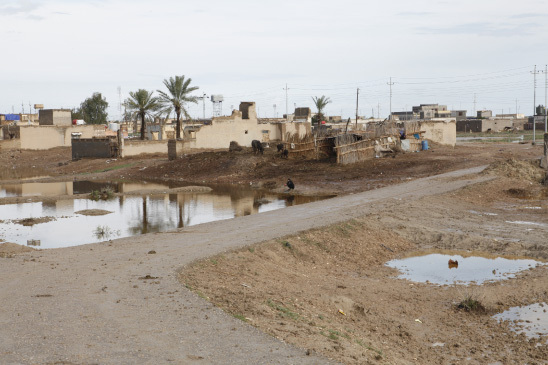 The site is on the east side of Al-Chibaish, near the main road to Basra (less than two hours away), and in-between the Central Marshes and the Euphrates River. To construct the new sewage treatment and reuse system, new septic tanks would be needed as well as redoing some of the existing plumbing.